Both political and financial concerns forced Russian writers like Chekhov and Bulgakov to find additional jobs alongside their writing, giving them experience they would later use in their work. Being a serious writer in Russia has never paid well. In Tsarist times a lack of widespread education confined the market for complex, challenging literature to a very small circle of readers. Then, in the USSR only authors loyal to the state ideology could live off their writing – others were forced to take on second jobs. Anton Chekhov worked as a doctor for 15 years and never regretted his decision. Most of his patients were peasants, servants and the poor. Chekhov joked, “I practice in aristocratic houses. Right now, I’m heading to Countess Keller to treat her cook and then to the house of the noblemen Voeykovs to attend to their maid.” Many of his patients couldn’t afford a doctor, so Chekhov treated them for free. Chekhov wasn't drawn to medicine by the money. He said, “The wish to serve the common good must be a requisite of the soul, a necessity for personal happiness,” and he stuck to this belief. In 1890 he traveled to a penal colony on Sakhalin Island to conduct a census and investigate the sanitary conditions of the prisons, hospitals and barracks there. He published his findings in a non-fiction work “Sakhalin Island,” which led to an improvement in the convicts' appalling conditions. In 1892, when a cholera epidemic hit central Russia, Chekhov organized medical relief for victims at his own expense. Chekhov once said, “Medicine is my lawful wife, and literature is my mistress.” But medicine also contributed a lot to his writing: his work contains detailed descriptions of his characters' health, illnesses and deaths. What's more, he heard a great deal of stories and learned a lot about human nature while practicing medicine – a valuable experience for any writer. Mikhail Bulgakov, who came from a family of medics, worked as a doctor for several years in the 1910s and even took part in World War I as a field surgeon. After the war, Bulgakov took a post as a doctor in a remote part of the countryside. He was the only doctor on hand and had to see dozens patients a day. Recently, Bulgakov’s experiences in those years have become widely known due to the 2012 British TV series “A Young Doctor’s Notebook” – a loose adaptation of the collection of stories of the same name. Bulgakov’s other works often have doctors as characters too. For example, the brilliant protagonist of “Heart of a Dog,” Professor Preobrazhensky, is an accurate portrayal of an intellectual facing the absurdity and brutality of the early Soviet state. If Charles Bukowski hadn’t worked his way through several menial jobs, the world would have never read “Post Office” or “Factotum.” The same can be said about the Russian writers Venedikt Yerofeev and Gaito Gazdanov. An aspiring author and philologist, Venedikt Yerofeyev was thrown out of college just because he read the Bible, which was unacceptable for a Soviet citizen. Also, he had developed a strong alcohol addiction by that time. After that, he started working in low­paid jobs, laying cables, drilling, loading freight, and even guarding a drunk tank. Finally, Yerofeyev became a cult figure as the author of “Moscow­Petushki,” a poem in prose that tells the Odyssey­like story of his eternally drunken alter­ego Venichka. The poem is notable for its mixture of highbrow literary references, religious metaphysics, urban folklore and obscene street slang, which Yerofeyev researched during his long years as an ordinary laborer. Another writer whose working life had a crucial influence on his literary career was Gaito Gazdanov, an underrated émigré novelist. His most acclaimed book, “Night Roads,” is based on the writer’s own impressions of Paris of the 1930s, where he worked as a taxi driver, docker and metalworker at a Citroën car factory. Gazdanov’s brooding prose is concerned with low­class Parisians, prostitutes and Russian émigrés. It is marked by the observant and philosophical approach of an intellectual who found himself on the very bottom rung of society. The Soviet state's philosophy was that every citizen should be able to live off their work. However, when it came to art, this had certain restrictions. As a writer, you had to join the Soviet Writer’s Union and stay loyal to the Party if you wanted financial success. This meant that Soviet writers took up a second profession as a means of gaining independence: if you didn’t want to comply with the state ideology, you still could earn money by doing another job. By his twenties, Alexander Solzhenitsyn already wanted to become a writer. He wrote poetry and essays, and had conceived an epic novel on the Russian revolution. When he went to college, however, he decided not to major in literature, and joined the Physics and Mathematics Department of Rostov University instead. He graduated with distinction as a math teacher. Four years after graduating, Solzhenitsyn was sentenced to eight years in a labor camp for his political views. When he was released he was sent into internal exile on the edges of the USSR, where his profession was a huge help to him. 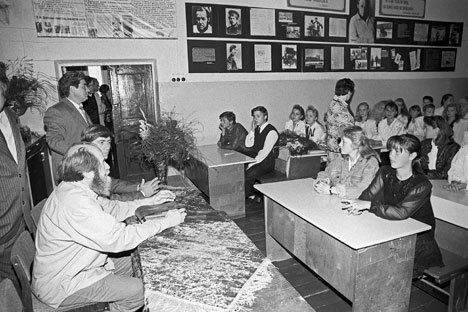 His worldwide acclaim was still years away, but Solzhenitsyn was able to provide for himself and his family by teaching math and physics in provincial schools. After his forced emigration to the US, Dovlatov continued his work in “The New American.” He could finally write openly and achieve the recognition he deserved.